This is a very special motorcycle with a very interesting history. Our customer and his brother grew up in Austin, Texas in the 1970's. Both were avid motorcycle enthusiasts and the eldest brother's dream motorcycle was a Ducati 750 Bevel-Drive Sport. He found the motorcycle at a local shop in Austin. This Sport was ridden but never raced for the first few years of ownership. This is why there are so few miles on this motorcycle. Then in 1983, our customer's brother was killed in an automobile accident by a drunk driver. For the last three decades this machine has spent most of its life under a horse blanket in a garage on a ranch in New Mexico where our customer lives. 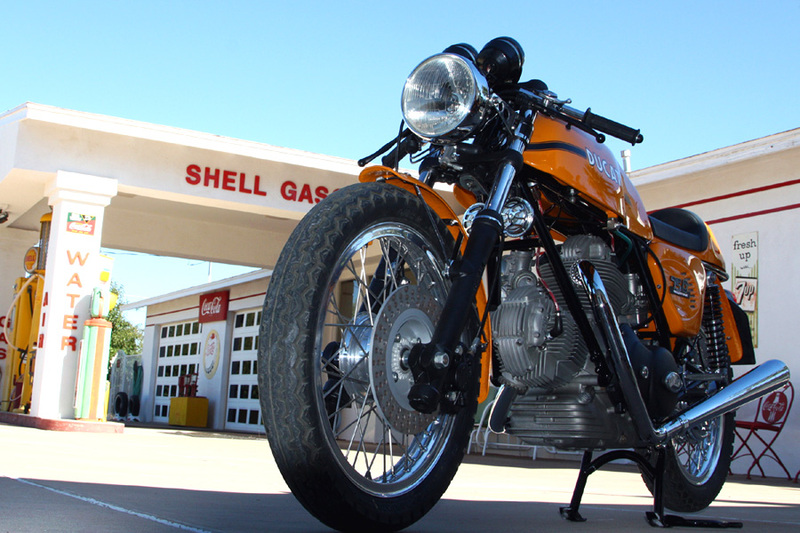 "Occasionally I brought the bike out and fired her up just to hear her sing." He stated, "and now I decided that it would be a fit memorial to my brother's life and passions if we were to bring the bike back to its original condition". We received the bike with suede leather seat and painted red among other incorrect but common changes seen on this era of bike. Our customer's other comment was that his brother thought that: "Ducati's should only be red!" As a result, we have poured love, care and expertise into this restoration and in bringing back memories and a special Ducati back to life. One of the World's Authority on those things Ducati, Mick Walker, describes the 1973 Sport as "748 cc overhead-camshaft, 90 degree V-Twin, high compression pistons, 32 mm DellOrto carburetors, 5 speed gear box, and Conti silencers" in one of his many books. Other than noted below, all parts are correct and original to this bike. The motorcycle carries a valid New Mexico title and comes with the original Ducati owner's manual stamped by the importer, Berliner Motor Corp.
Frame and bodywork professionally painted to original specifications. Correct paint colors and finishes. No powder coating. Re-chromed headers 0755 84 020 and 025 and Conti clamps with crossover pipe. The "Ducati" logo highlighting on the engine cover is not correct, but a personal preference and the way that my brother had it originally. Most original items and fasteners have been re-polished with some stainless fasteners. The engine bottom end has never been opened as evidenced by the original factory lead seal on the bottom of the case. Malcolme wrote "The Crankshaft on this engine looked to be in very good conditions and I could feel NO appreciable wear." Our customer has received valuations from different professional organizations. However, I know that the key to purchasing this magnificent Ducati Bevel Drive 750 Sport is for that enthusiast who can best appreciate such a beautiful piece of history and make their best offer. Photos of the build are available. Additionally, we can show this motorcycle on appointment at our shop in Tucson, Arizona USA for the serious buyer.